Norwegian Foreign Minister Eini Eriksson said Tuesday that her country is prepared to contribute to the reconstruction of what Dahesh destroyed. The Presidency of the Republic, in a statement received by "Economy News" a copy of it, "The President of the Republic Barham Salih received today, at the Peace Palace in Baghdad, Norwegian Foreign Minister Eini Ericsson." Saleh said during the meeting that "Iraq is looking forward seriously to open up to its Arab and international environment and develop bilateral relations in order to achieve its growth and prosperity and rebuild its affected cities, especially after the victory over gangs and terrorist advocates." The President stressed that "the transition from the stage of defeating terrorism to the stage of construction requires ending the crises experienced by the country and building the political system and reform and restore the citizen's confidence in his government, and this will not be achieved without the help of brothers and friends and their support for political and economic reform," and expressed his thanks for " Norway within the international coalition against terrorism, which had clear support for Iraq. " 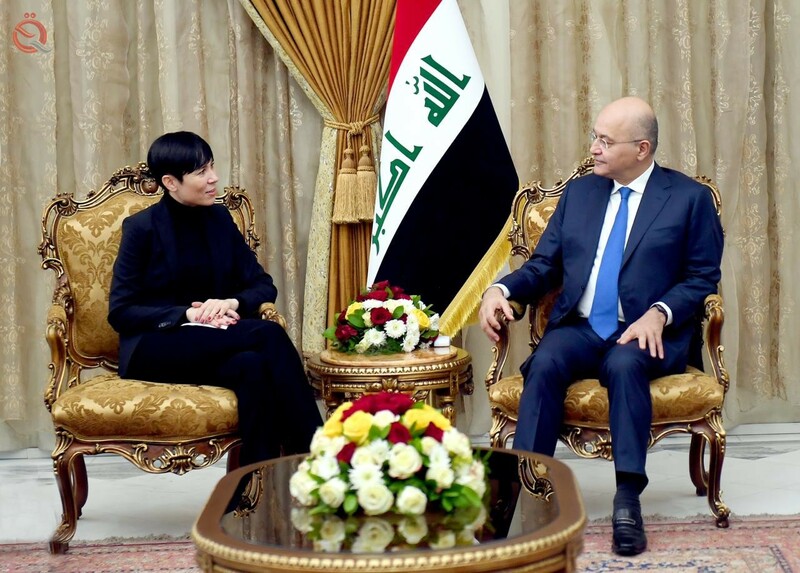 For her part, Secretary Ericsson reiterated her country's support for "Iraq's people and government and seek to develop relations between the two countries in the political, economic, oil and energy." The Norwegian minister expressed the willingness of Norwegian companies and businessmen to "contribute to the reconstruction of the country."